Have you heard all of the hullabaloo about the new Zodiac signs today? What did you change to? Do you consider it hogwash or are you disappointed? I switched from a Capricorn to a Sagittarius and eh it doesn't really phase me, but boy am I fascinated by the cosmos. 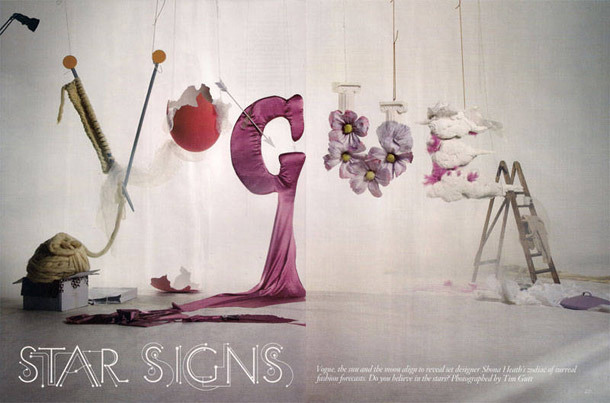 Recently I came across this whimsical and stunning photographic fashion spread in December's 2010 British Vogue representing the twelve signs of the zodiac and thought it would particularly suit today. The photographs are by Tim Gutt, and you can see the whole collection of photos from the series here. Very beautiful! I also did a round up of some Zodiac inspired items that you may enjoy over here. Wow, love the photos...very cool idea! What?! Is it possible to refuse to change? Ha! I'm all about change, but this was unexpected and not something I'm too fond of. I'm a Leo and think I'd like to remain a lion, thank ya! : ) Definitely going to read up more on this change. Your zodiac sign depends on the position of the stars on your date of birth. It is only because the earth has shifted in the time since the original zodiac signs were named that there was any need for a 13th sign. Unless you were born after 2009 when the sign first appeared that is has any effect on your sign. this is some crazy stuff, but i dont think i can change my signs (im a cusp), the constant over-analyzation of them have made me who i am today! dont think i could ever let them go! this spread is brilliant though, these are my favorite colors right now. damnit vogue, you are so spot on always! i think it's just that most people follow the western zodiac system that doesn't really go with the constellation and there is also a more eastern system that is closely tied to the stars. so you're just different things in the different systems. Oh no, you cannot just wake one morning and be a completely different sign! That`s ridiculous! I will always be an Aries, though I should be Pisces now. Pisces and Aries that`s a different world! But still, most of the time I feel like a Leo, because I have a Leo Ascendent:-)So never mind the change. I love the mugs on your Babble post! I hope it's not true. That means I'm a Gemini! And I had finally made peace with my Cancer sign. Humpf! I'm not changing; I've decided. To heck with them (whoever "them" is)! I've been an Aquarius my entire life and have always considered it the best (no offense to anyone else). I've been reading your blog for awhile now but am a first time commenter - nice to meet you! I love that spread in British Vogue! I was just re-reading it and loving the Aries photograph. In the Editor's letter, Alexandra Shulman said the giant jumper cost 4,000 pounds to make using specially produced giant knitting needles. And about the change... I never really felt like a Pisces, so I guess I don't mind too much. It's all about Shona Heath the set designer for me. I love her Tim Walker collaborations most but man it sure is a cool looking fashion shoot.